Word came of riches beyond the imagination to the south, and Pizarro made a pact with a soldier (Diego de Almagro) and a priest (Hernando de Luque) to explore and conquer the region and divide the spoils equally between them. The three convinced the governor of Panama to finance their forays into South America. 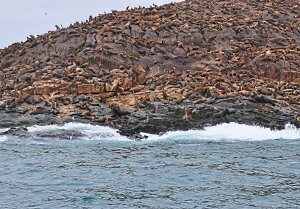 We left the calm waters of the Galapagos and returned to Quito, Ecuador, for the final night of our 10-night Celebrity vacation. The next day, most of the passengers from the cruise headed north to the U.S., but our small group boarded a 2 ½ hour flight south, to Lima, Peru. We were in the neighborhood anyway, so we had decided to push on to Machu Picchu, one of the man-made wonders of the world. Celebrity's Galapagos cruises can be combined with an optional three-day add-on trip to Machu Picchu. We wanted to stay longer and enjoy more of Peru's fascinating sights and attractions, so we booked a seven-night itinerary with three nights in Lima, three in Cuzco and one near Machu Picchu. 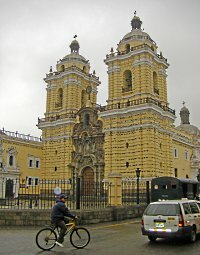 Except for the summer months of December through March, Lima is covered with clouds almost continuously, and we touched down on a cool, overcast morning. We checked into the gracious and welcoming Country Club Lima, one of the city's top-rated hotels. 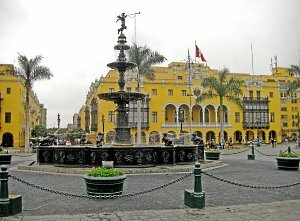 Lima's historic center features numerous examples of colonial-era architecture, including the Cathedral of Lima and the Monastery of San Francisco. Construction on the former started in 1535, and though the structure has undergone earthquakes and numerous repairs and transformations, it still retains its colonial style and façade. One of the darkest imports from Spain, the Inquisition was officially tasked with eliminating heresy, blasphemy and witchcraft. The indigenous people were generally not subject to prosecution since they were considered by the church to be "gente sin razón" -- individuals without reason. The primary targets were Jews and Muslims. After a day spent exploring the history of Lima, we were ready to visit the wild and little-known Palomino Islands, just off the coast. The islands are fed by the same Humboldt Current that goes all the way to the Galapagos, but it's colder, rougher and richer here, 1,300 miles closer to the source in Antarctica. 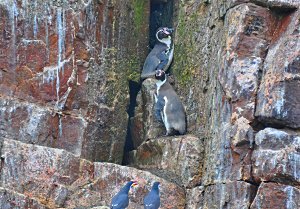 In the Palomino Islands, the Humboldt supplies the fish that support an incredibly dense population of sea lions and birds, and sustains the Humboldt penguins, which are larger and healthier in appearance than Galapagos penguins. Tomorrow, we leave for Cuzco, high in the Andes Mountains, a destination in itself and the gateway to Machu Picchu. Cuzco was once the center of the Inca Empire, the main obstacle standing between Pizarro and the riches of the New World.